Today was a bit of a rough day because Rori was feeling under the weather and especially whiny. I figured I could give them some M&M's to make them happy and then they'd sit for a while without climbing up my legs. 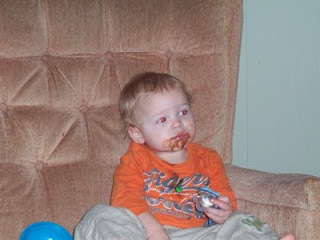 Liam eats M&M's like it will be his last opportunity. He shoves all of them in his mouth (giving mommy a heart attack) and then sits there waiting for them to dissolve enough that he can chew them. In the mean time, the chocolate, that melts in your mouth--not in your hand, starts to come out in a massive pool of drool. It's lovely. I guess this is what having a boy is all about. Here he's still waiting for them to dissolve--and the green one is still on his shirt. 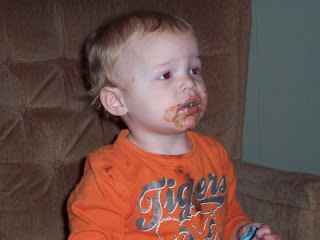 My boy, I am so proud that you eat like your papa!!! I should try those with Noah. He's never had M & M's before. I love the M&M faces... glad he got the green one! Love MOM Don't know why this is letting me post, I can't figure out a pattern here. Awww!! 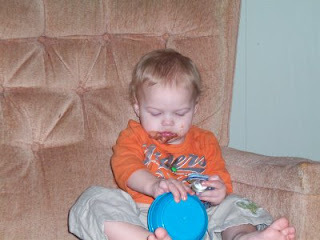 I can't wait for my little boy to grow up and gobble-and-drool his M&Ms!!! super cute pictures! He learned all of that from Grampa Jim. If there is candy around he will find it.